Laser-magnet metrology; giant X-ray laser; China’s neutron source. 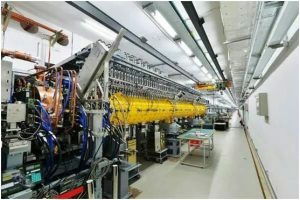 The FELIX Laboratory and the High Field Magnet Laboratory (HFML) have recently conducted the first measurements that combine a free electron laser (FEL) with a powerful magnet. The combination enables researchers to explore the electronic properties of materials. 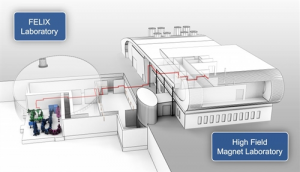 It provides a way to perform terahertz (THz) magneto spectroscopy on samples. The FELIX Laboratory at Radboud University is home to several THz free electron lasers. Radboud is based in Nijmegen, the Netherlands. Traditional lasers fire electrons that are bound to atoms or molecules. In contrast, an FEL shoots high-speed electrons through a magnetic structure. An FEL is tunable and ranges in various frequencies. They are used for advanced spectroscopy and other applications. The four lasers in the FELIX Lab each produce various wavelengths with tuning ranges between 3µm and 1500µm. A THz FEL is used for electron spin resonance (ESR) spectroscopy in high magnetic fields. The HFML, meanwhile, is operated by Radboud University and the Netherlands Organization for Scientific Research. HFML consists of various high-field magnets, including a 33 tesla system. Tesla, or T, is the measurement of magnetic field strength. Another measurement unit is called gauss. One tesla equals 10,000 gauss. A refrigerator magnet has a field of 0.01 T or 100 gauss. The Earth’s magnetic field is about 0.5 gauss or 0.00005 tesla. An MRI scanner has a 1.5 tesla magnet. Meanwhile, FELIX’ THz FEL and HFML’s magnet are located in the same complex. The laser is located in the basement of the FELIX Laboratory. The laser is directed around 90 meters to the magnet in the neighboring HFML building. In operation, a beam from the laser is fired from an exit slit to the top of the magnet through a 90-meter transport line. The line has 41 gold-coated mirrors with an aperture of 250mm. A separate diagnostic station enables researchers to perform high-field and multi-frequency ESR experiments. In one experiment, researchers took high-field ESR in a solid polycrystalline DPPH material. The next step is to use the THz spectrometer and explore the properties of superconductors, semiconductor nanostructures, magnetic materials and organic crystals, according to Dmytro Kamenskyi, leader of the FELIX/HFML. “This experiment provides us with critical information about the behavior of the spectrometer. The knowledge that we obtained is crucial for our future experiments on other materials and represents the first step towards a THz spectrometer at the highest possible magnetic fields of 45 T, which we will apply in the near future,” Kamenskyi said. The European XFEL, the world’s largest and most powerful X-ray laser, is officially open for business. The European XFEL is located in underground tunnels in Germany. The 3.4 kilometer-long facility runs from the DESY campus in Hamburg to the town of Schenefeld in Schleswig-Holstein. In the works for years, the European XFEL generates X-ray flashes and electrons. The electrons are accelerated into high energies and then directed through an arrangement of magnets. The facility will generate up to 27,000 pulses per second–200 times more than other X-ray lasers. The facility also consists of specialized instruments, which enable researchers to gain insights into the atomic details of materials and other technologies. The first two instruments in the underground experiment hall include the femtosecond X-ray experiment (FXE). FXE will enable researchers to study the reactions of compositions and record molecular movies. Another instrument–the single particles, clusters, and biomolecules and serial femtosecond crystallography (SPB/SFX)–is used to explore the structure and transformation of biomolecules and other biological particles, such as viruses and cell components. After several years in development, the China Spallation Neutron Source (CSNS) facility has produced its first neutron beam. The CSNS facility, located in Dongguan, Guangdong Province, is said to be the world’s fourth pulsed spallation neutron source. They are used for neutron scattering, a measurement technique that helps unravel complex structures. Neutron scattering enables researchers to perform depth profiling, diffraction and other applications on a range of materials and compositions. The CSNS facility is composed of a linac of 80 MeV. It also has a rapid cycling synchrotron (RCS) of 1.6 GeV, two beam lines and a target station with a solid tungsten target. The facility will have three instruments for the first phase, including a general-purpose powder diffractometer (GPPD), a small-angle neutron scattering instrument (SANS), and a multi-purpose reflectometer (MR). The GPPD is used to study crystal and magnetic materials. SANS is used for probing structures from 1nm to 100nm The MR is used to study the surface and structure of materials. The facility is expected to be completed and open to domestic and international users by 2018.